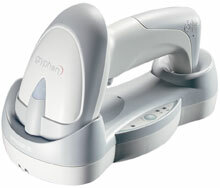 The Datalogic Gryphon Cordless has been discontinued. No direct replacement is available. A host of features provides optimized reading performance with the Datalogic Gryphon Cordless reader series. The Gryphon reader series has been developed by Datalogic to provide outstanding reading performance and excellent ergonomic design combined with unmatched durability. The balance of top-of-the-range features and extreme versatility of the Gryphon makes it the ultimate solution for many applications in retail as well as in light industrial environments where low resolution and/or damaged codes need to be read without problems. The optimized optics of the Gryphon series allow reading of the most popular standard codes with superior depths of field from near contact to over 43 cm (long range version). The green spot, (Datalogic patent application) produced by the Gryphon provides good reading feedback directly on the code, useful in under-lighted or noisy environments. Gryphon connectivity is now further expanded thanks to the introduction of new multiple interface models (Wedge, USB, RS-232 and Wand), the D130 and D230. Besides these models, the new Gryphon Long Range model D130 LR is also now available. This new model offers long range reading distances, up to 43 cm (13 mils resolution for EAN and 100%UPC codes). In addition, the Gryphon readers also read Reduced Space Symbology (RSS), an emerging symbology that can be printed on a smaller label which meets emerging market needs for a greater amount of data on a symbol. The Gryphon M100 and M200 models supported by the DATALOGIC STAR cordless system, the most reliable radio in the market which allows operations anywhere mobility is required at the Desk/POS and around the shop floor, as well as in small warehouses. The introduction of instinctive reading distance technology in a cordless scanner permits the Gryphon Cordless 100 and Gryphon Cordless 200 to answer the needs of a wide range of applications. Management of traditional shops from receiving to point-of-sale becomes easier with the use of a reader without cable constraints. Merchandise no longer needs to be moved around the store floor during inventory and price checks. Time consuming activities such as reordering and stock replacement recording typically done on paper can now be executed in real time thanks to instant data transmission to the information system. In particular point-of-sale environments such as wholesale, cash & carry and DIY stores where goods are usually large and heavy, the items cannot be lifted easily onto flat-bed scanners. In this case, the Gryphon Cordless readers are ideal due to their mobility, which lets the operator move around the sales cart. The Gryphon Cordless 200, which reads linear and stacked codes, provides an additional value in applications where PDF417 codes are used, such as in document handling, shipping and receiving. Both models supply cordless alternatives in many activities where the operator needs flexibility and mobility. In distri-bution environments, the cordless Gryphon Cordless readers are very useful in managing damaged and returned item applications, as well as picking operations. In Transportation and Logistics environments, such as on loading docks, where goods shipping and receiving requires freedom from cable constraint, the Gryphon Cordless models offer the ideal solution. The Gryphon Cordless 200 decodes information contained in stacked codes typically used to store data of an entire pallet of merchandise. Regarding Manufacturing, the cordless Gryphon Cordless fulfils the needs of new industry standards that recommend the use of linear and PDF417 codes on tracking and shipping labels, as well as guaranteeing safety by eliminating the use of cables.